LOS ANGELES, CA (September 1, 2013)—Dr. 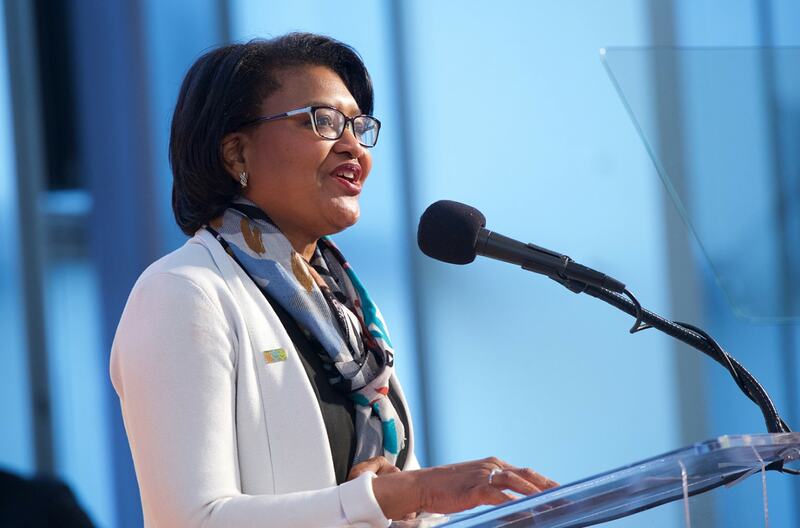 Elaine Batchlor, CEO of the new Martin Luther King, Jr. Community Hospital, which will open in early 2015, was named as one of Becker's Hospital Review Top 125 Physician Leaders of Hospitals and Health Systems. The list is compiled based on healthcare experience, accolades, and commitment to quality care. Dr. Batchlor is the driving force behind the efforts to open a new, state-of-the-art, community oriented, safety-net hospital that will provide compassionate, quality care and improve the health of the South Los Angeles community. Throughout her career, Dr. Batchlor’s number one priority has been quality of patient care. With more than 25 years of healthcare experience within large, diverse communities, she has expertise in medical leadership, HMO administration, government health programs, public health administration, and healthcare financing and delivery. Before assuming her leadership position at the Martin Luther King, Jr. Community Hospital, Dr. Batchlor served as Chief Medical Officer of L.A. Care Health Plan, the nation’s largest public health plan that provided care to the county’s most vulnerable population. Dr. Batchlor received her Bachelor of Arts from Harvard University, her Master of Public Health (MPH) from the University of California, Los Angeles (UCLA), and her Doctorate of Medicine (MD) from Case Western Reserve University. She completed her internship, residency, and fellowship in internal medicine and rheumatology at Harbor-UCLA Medical Center and is board-certified in both specialties. The new, private Martin Luther King, Jr. Community Hospital is currently under construction and is scheduled to open in South Los Angeles in early 2015 as a national model for accessible, collaborative, comprehensive, and culturally sensitive healthcare. The new hospital will serve the community by providing high-quality health education, preventive care, and medical treatment regardless of citizenship or ability to pay. The board of directors of Martin Luther King, Jr. – Los Angeles Healthcare Corporation, (MLK – LA) which governs and operates the new community hospital, is committed to establishing high-quality medical services (in partnership with the University of California and Ronald Regan UCLA Medical Center), implementing the right resources needed to create a quality, sustainable, coordinated healthcare delivery model in South Los Angeles.